Life is taking unexpected turns from the last few months or so. I'm still coming to terms with it. We are having not so good days and hoping that the ray of light is not far away. All I can say is, God is helping us and he will definitely be with us. Hopefully, I will start blogging frequently from now on. We went strawberry picking and got a whole basket of strawberries home. 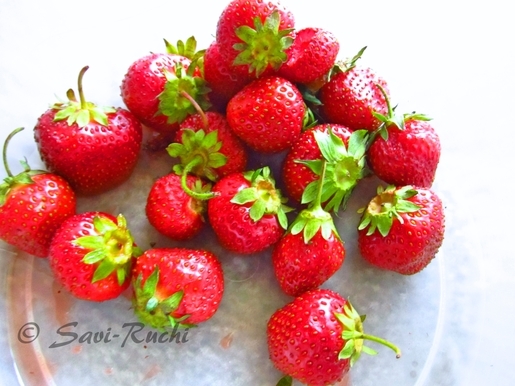 So, I started experimenting and made lots of new recipes using strawberries. I'll try to post all of them. 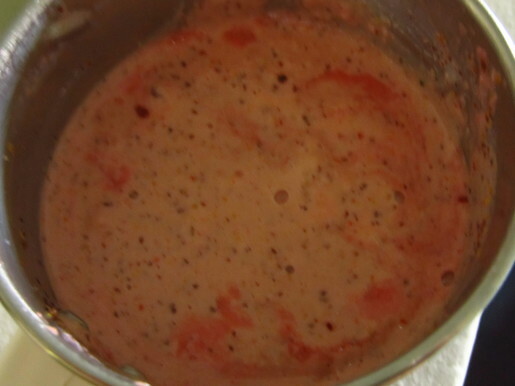 One of the first recipes that I tried was this strawberry sasive, I loved it thoroughly. Wash the strawberries thoroughly and roughly chop them. 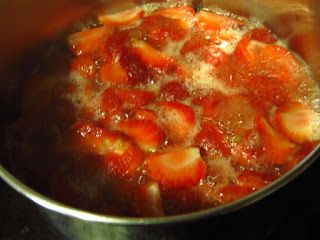 Add about 1/4 cup of water, salt, jaggery to the chopped strawberries and bring it to a boil. Strawberries get cooked pretty fast. In less than 5 minutes, strawberries will be done. Allow the strawberries to cool. Make a fine paste of the items mentioned under the coconut paste. Add very little water. You could use the water used for boiling the strawberries. 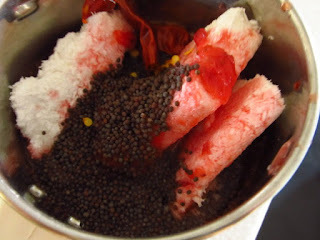 Add the cooked strawberries to the coconut paste and crush it coarsely. Scoop out the mixture to a bowl. Add the whisked yogurt. Mix well. Prepare the tempering. Add oil in a small pan. When oil is hot, add the mustard seeds. 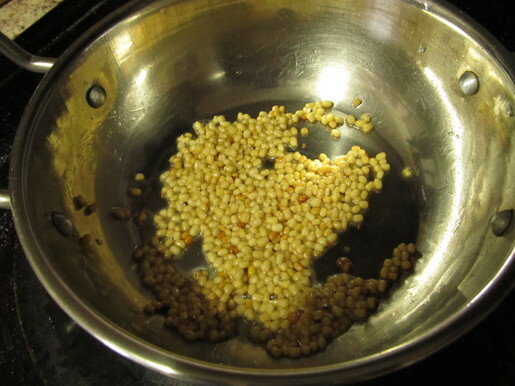 When mustard seeds crackle, add the cumin seeds. 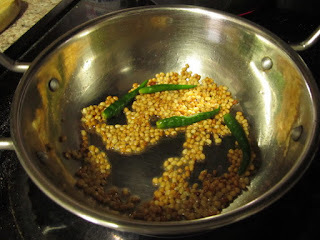 When cumin seeds turn golden brown, add the curry leaves and red chili. Remove from the heat and pour it over the saasive prepared. Mix well and serve with steamed rice. Do not use very sour strawberries. Try to use sweeter ones. 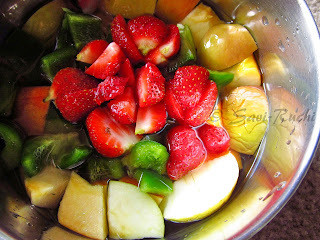 If the strawberries are very sour, try using 3 or 4 only. 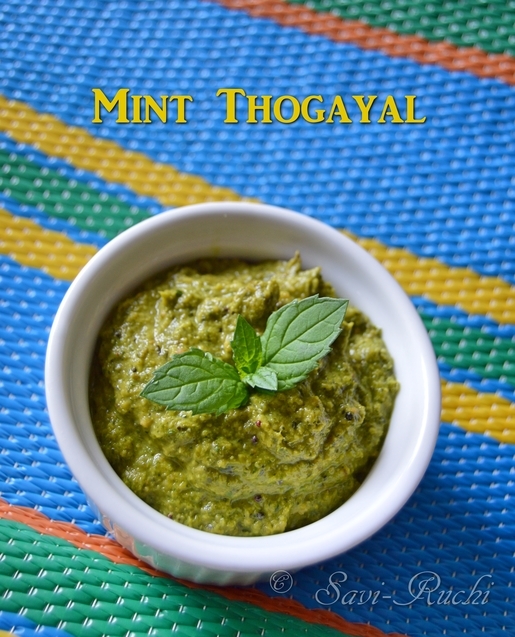 Pudina Thogayal is a South Indian version of the mint chutney that is popularly consumed as a side dish for steamed rice. 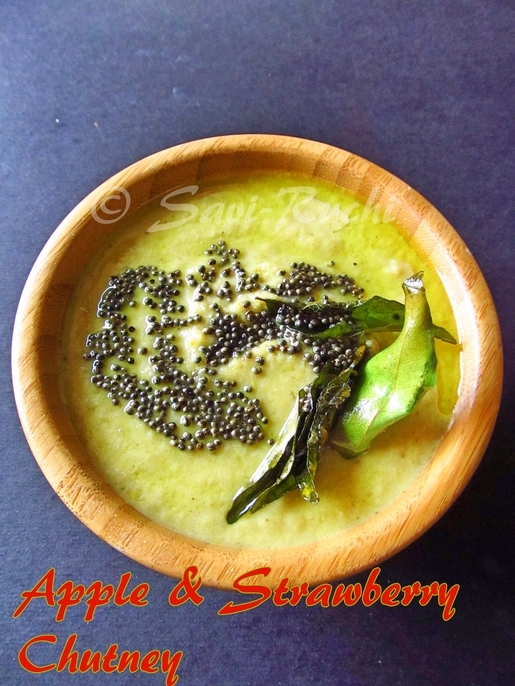 It is very flavorful and goes well with so many South Indian items like dosa, akki rotti, or uttappam. 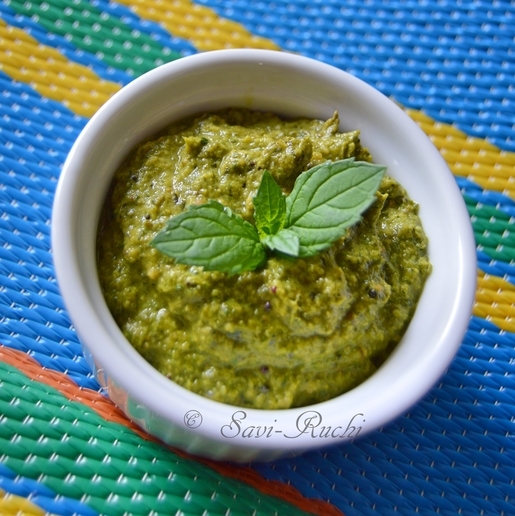 I make this chutney mostly in summers as I harvest mint once in 15 days (I grow it in my balcony garden). 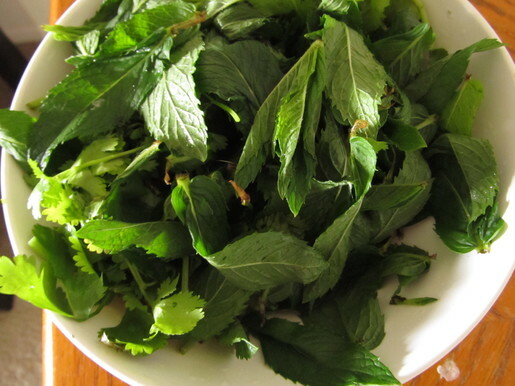 Also, mint helps cool down your body in hot and humid summer days. Cilantro can be washed and used along with the tender stems. 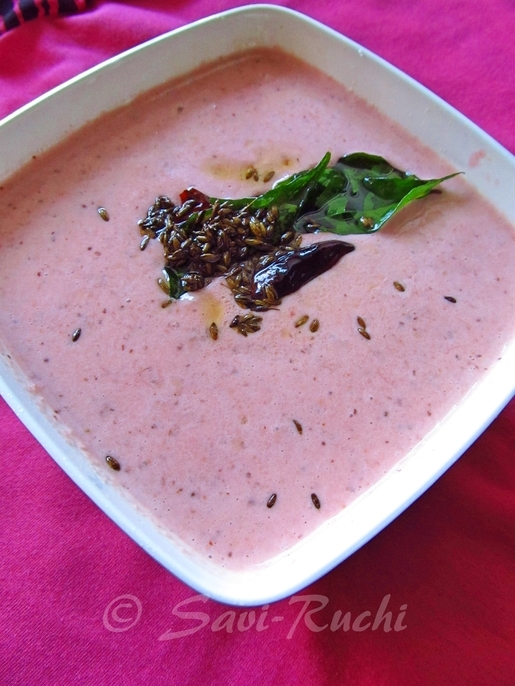 The stems of the cilantro adds volume to the thogayal and also makes it flavorful. 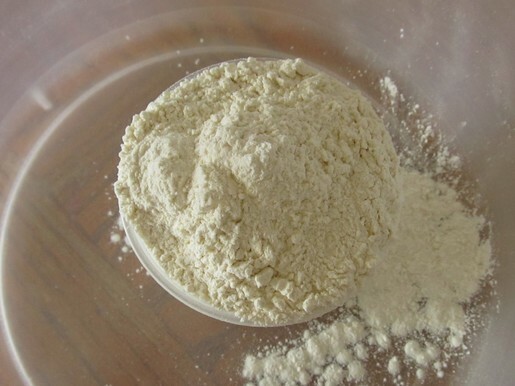 Do not add more water while making a coarse paste. The thogayal needs to be thick. Add a teaspoon of water at a time and continue grinding. 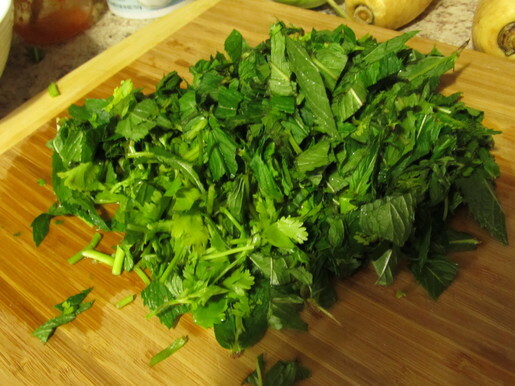 Wash the mint and coriander leaves thoroughly and roughly chop them. In a broad wok, heat oil. 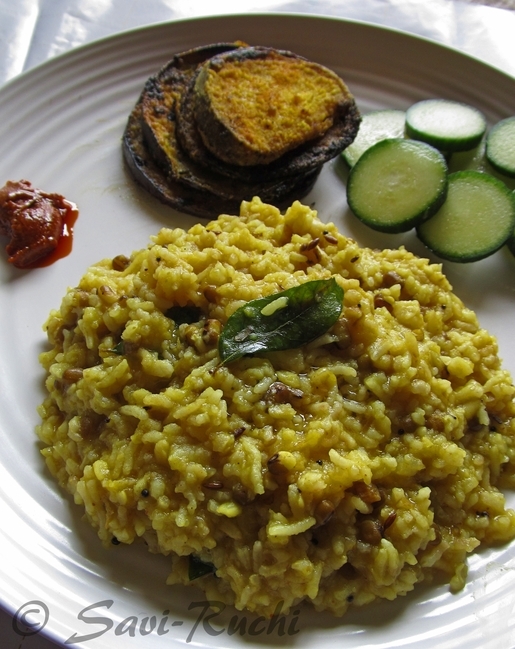 When oil is hot, roast the urad dal until golden brown. When the dal is golden brown, add the green chili and saute for 15 secs. Add the roughly chopped mint and cilantro. Saute till the leaves wilt and become soft. 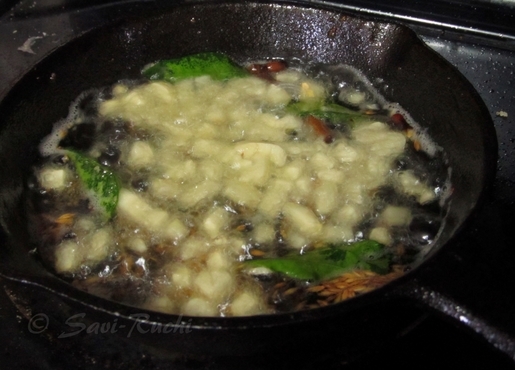 When leaves are soft, add the turmeric powder, salt and the tamarind. Turn off the heat and allow the leaves to cool for about 5 minutes. 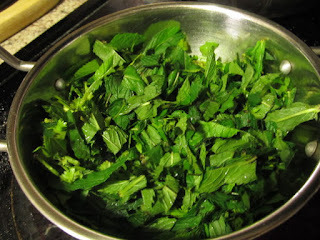 Scoop out the cooked mint mixture to a blender or mixie jar. 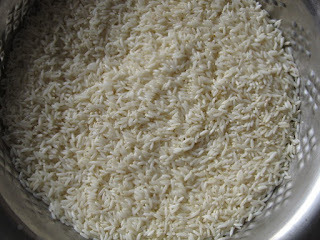 Add the grated dry coconut and make a coarse paste out of it. Add couple of tablespoons of water, if needed. Heat oil in a wok. When oil is hot, add the mustard seeds. When seeds crackle, add curry leaves and broken red chili. 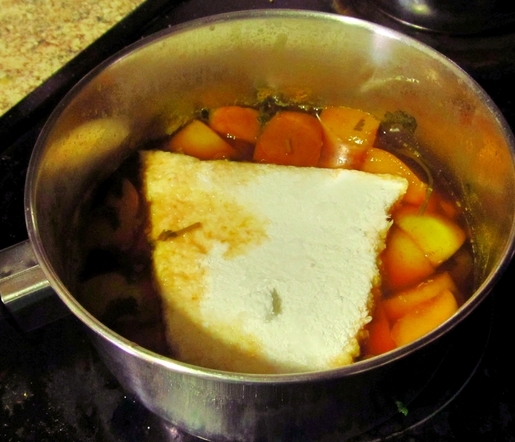 Scoop out the chutney paste to the wok that has the tempering and heat the chutney until the extra water is absorbed. 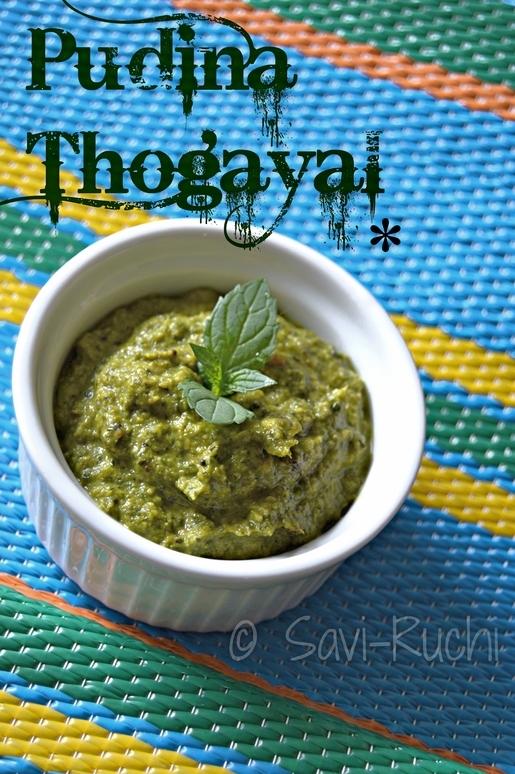 Cook the thogayal on a low heat for about 3-5 mins. Turn off the heat. 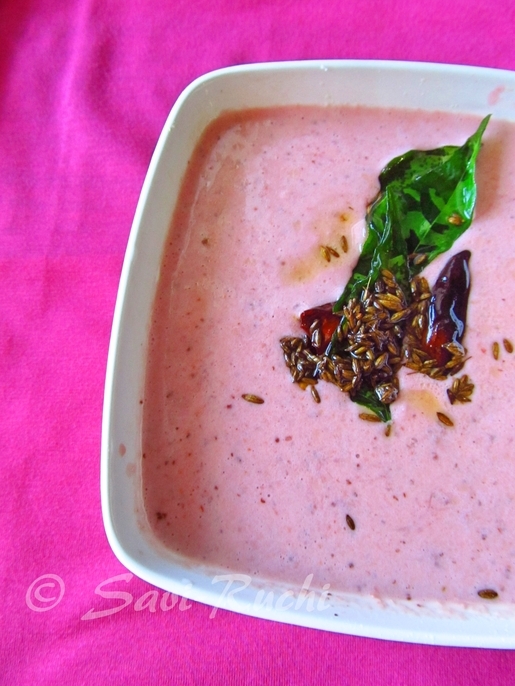 Allow it to cool and serve it with rice or dosa. 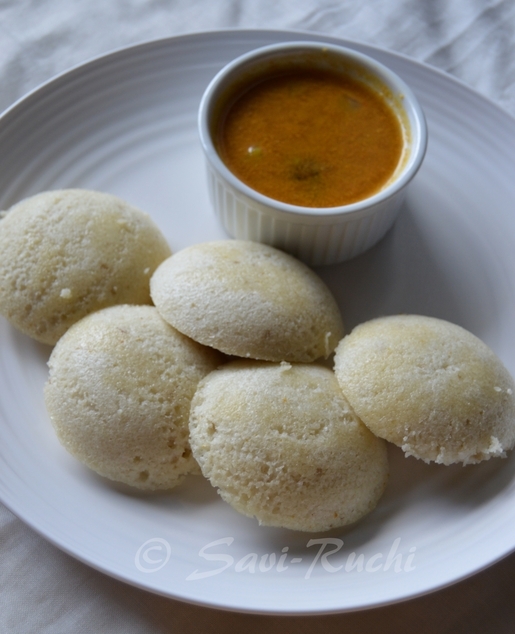 Idli is a South Indian breakfast/tiffin recipe that is mostly gluten free and vegan. 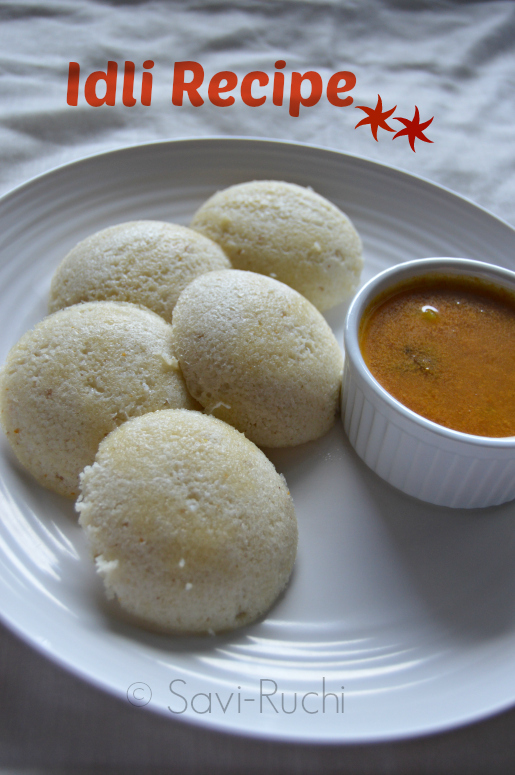 Idli is made with fermented lentils and rice mixture. 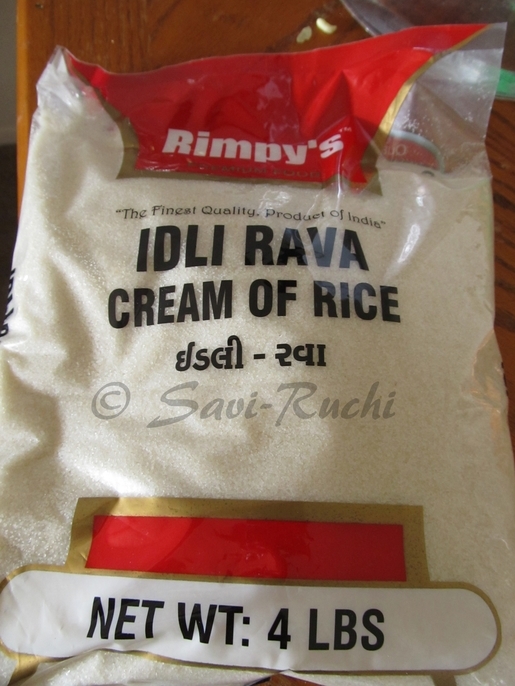 However for instant idlis or no grind idli, we add yogurt to skip the fermentation process. Addition of baking soda, fruit salt or citric acid crystals are common too. I'm having a tough time cooking these days and always avoid soaking, and grinding of the urad dal. 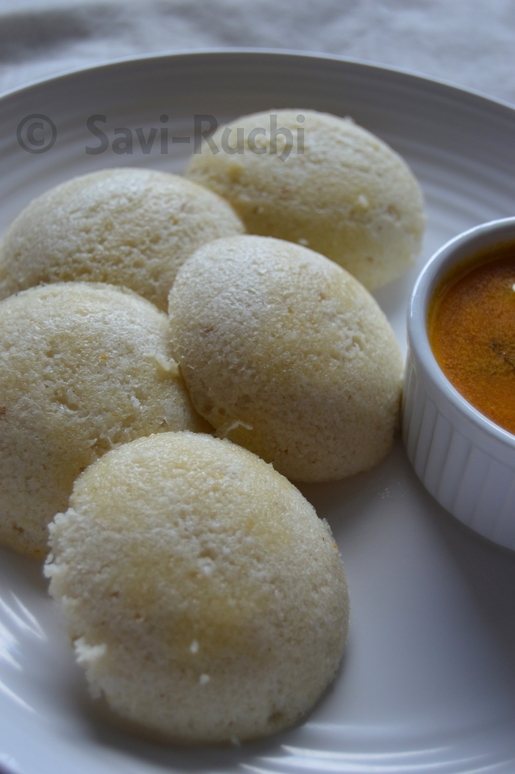 So, I came up with this idli recipe. 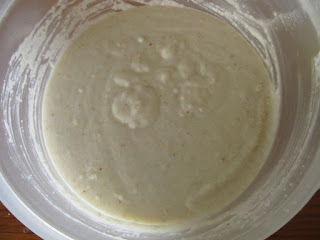 It does need fermentation but I did avoid yogurt and all other rising agents like baking soda, fruit salt etc. Add about 2 cups of water to the urad dal flour and whisk well. 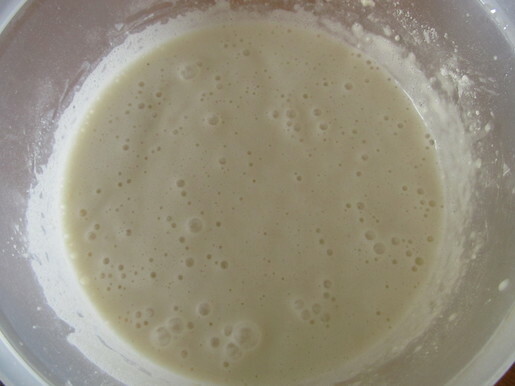 You can use a hand blender or whisk to make the batter airy and frothy. 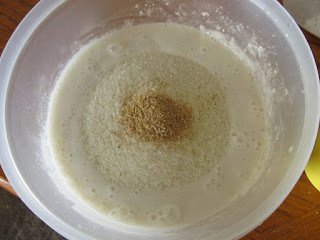 Add the idli rawa and fenugreek powder to the whisked urad dal batter. Fold in. You should not whisk now. Just mix it. Add water, if needed. The batter should be like a thick milkshake/smoothie consistency. Keep the batter in a warm place overnight or for a minimum of 8-10 hours (this depends on the outside temperature too). 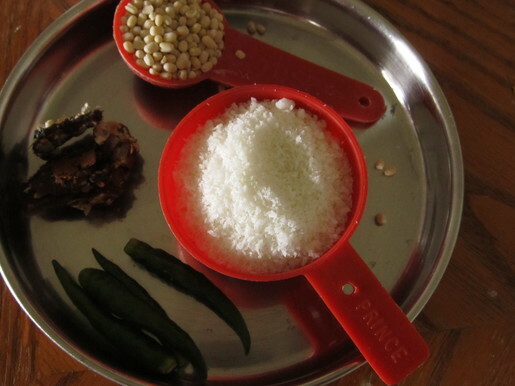 Before making the idlis, add salt and mix. 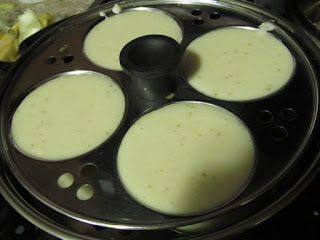 Grease the idli moulds and scoop out about 1.5 tbsp of batter to each mould. Steam the idlis for about 15 mins. Allow it cool for 5 mins. Once the steamer is cool enough to handle, remove the moulds and scoop out the steamed idli using a spoon or blunt knife. 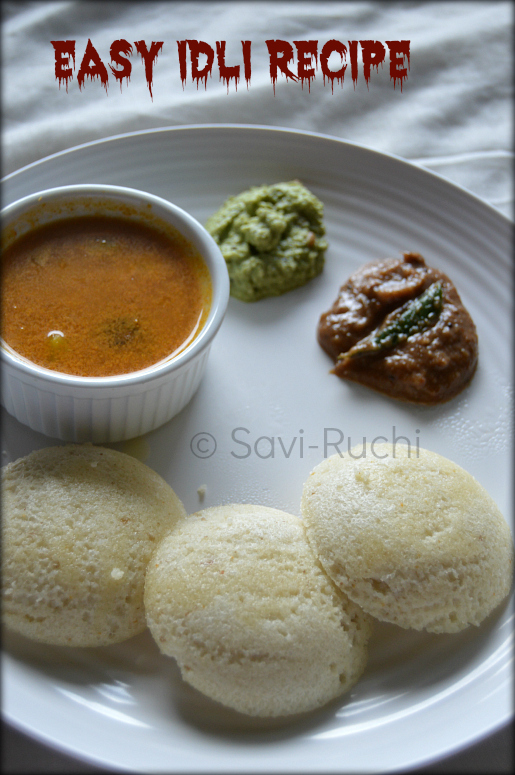 Serve the idli hot with a side dish/dip of your choice. 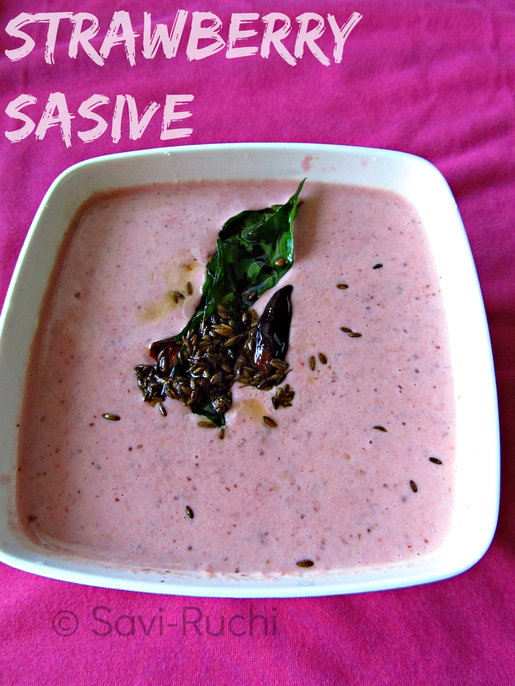 Some side dishes that go well with idli are given below. 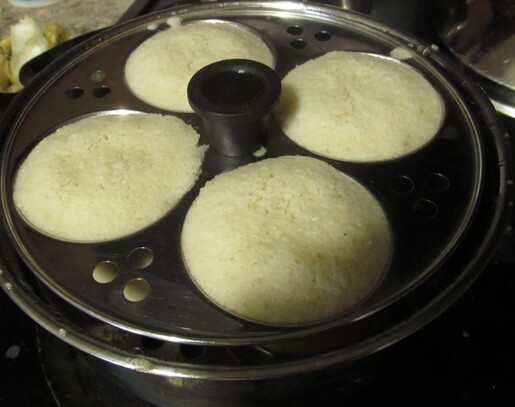 Please refer here for all the tips and tricks to make idli. 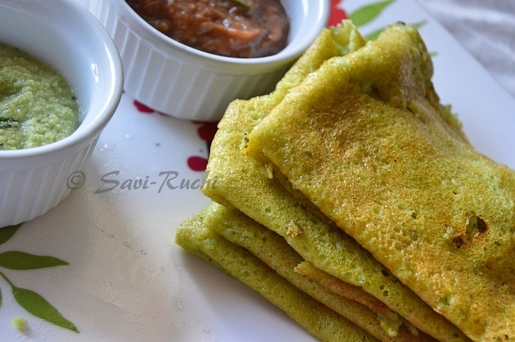 Cucumber Dosa | Southekai Dose | Cucumber Crepes : Gluten free and vegan recipe. Cucumber dosa doesn't need any fermentation. 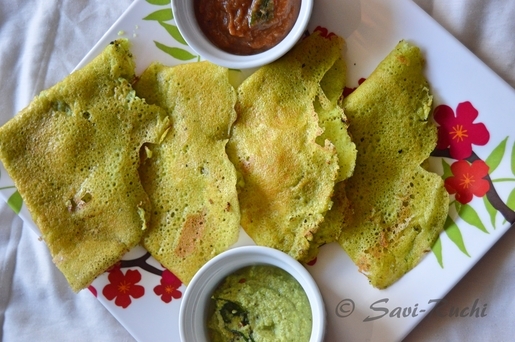 It's very quick to make, gluten free, vegan and healthy dosa recipe. 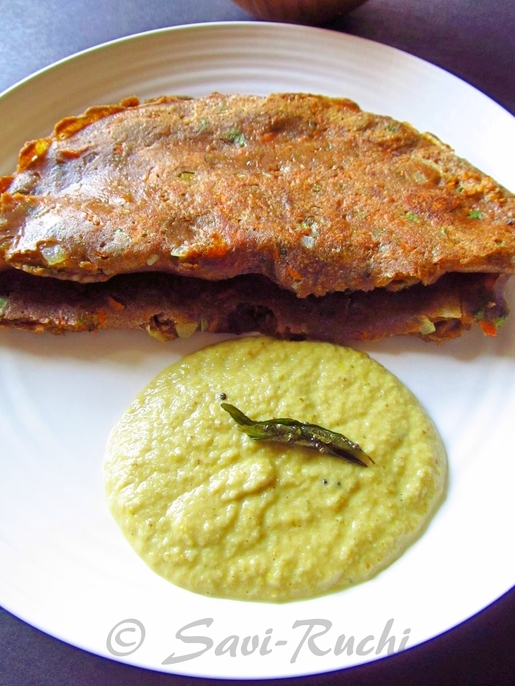 The specialty of this dosa is, it stays soft for hours. You can pack this for lunch and also eat it cold or at room temperature. 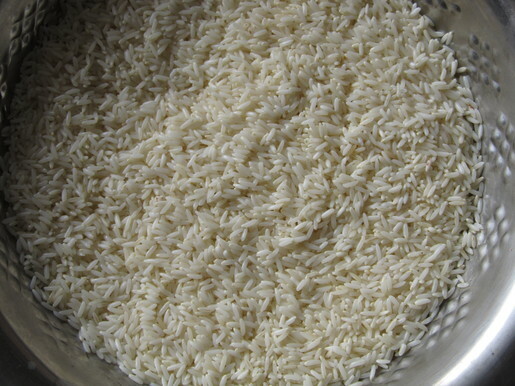 Wash the rice thoroughly and soak the rice in enough water for 3-5 hours. Drain the water from the rice. Reserve the drained water. First add half the cucumber cubes and half the soaked rice to the mixie or food processor. Do not add water while grinding the rice. The cucumber oozes out enough water to grind the rice to a smooth paste. 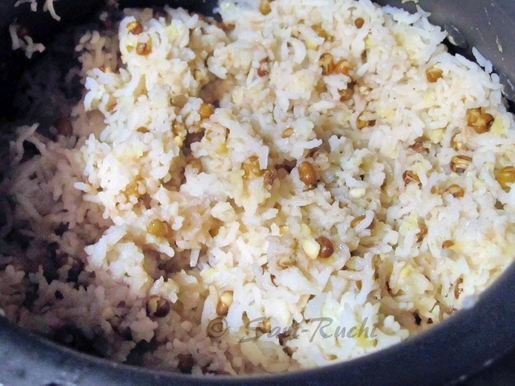 Repeat the grinding process until all the rice and cucumber is ground to a smooth paste. Scoop out the paste in a sauce pan or a mixing bowl. Add enough water (you can use the drained water here!) and salt. Mix well. Heat a griddle. I use a cast iron griddle to make my dosas. 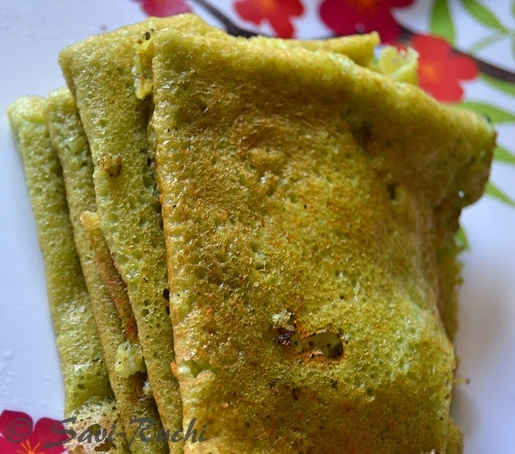 Make dosas similar to rava dosa or neer dosa. You can refer the video here. You need to cook only one side for this dosa. 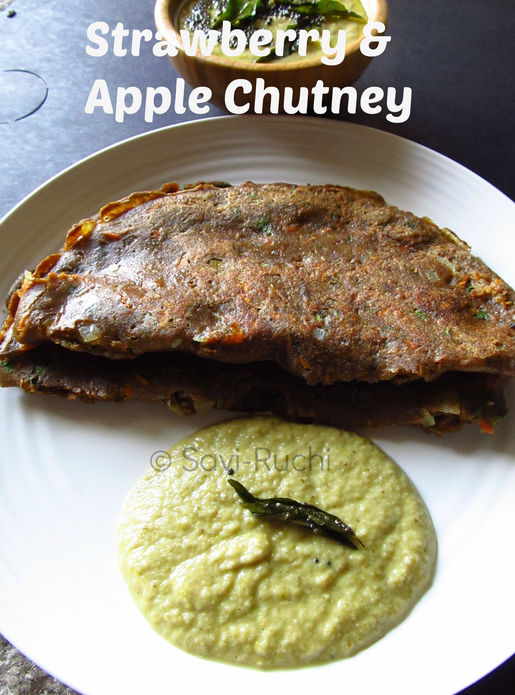 Serve the dosa hot or at room temperature with a chutney/dip of your choice. 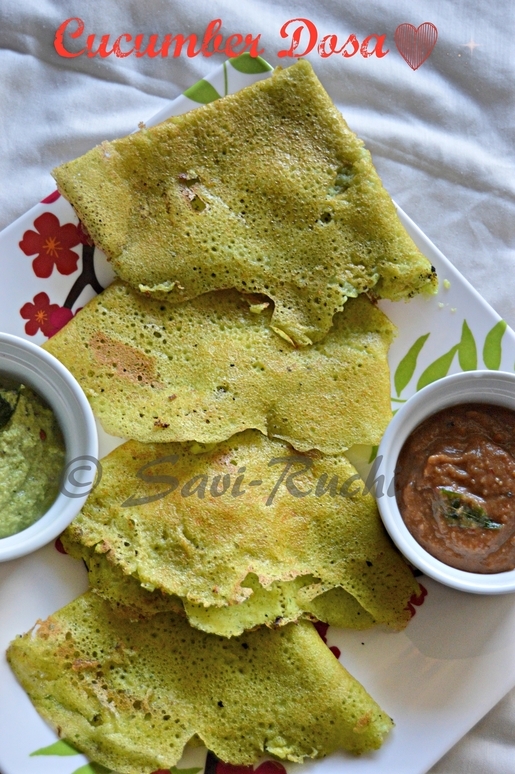 I have used sona masoori rice, basmati rice, and ponni rice to make this dosa. You can use any rice of your choice. 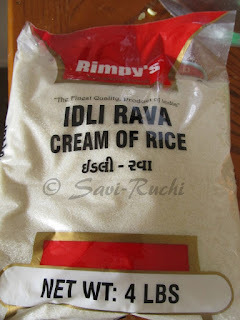 I however do not recommend boiled rice or idli rice. 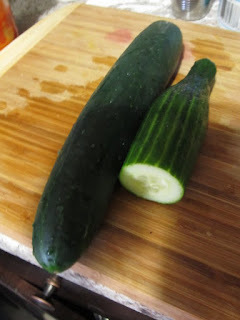 I use the whole cucumber as is with the skin and the seeds. You could peel the skin, if you want to. I roughly use about 2 to 2.5 cups of 1 inch cubed cucumbers. 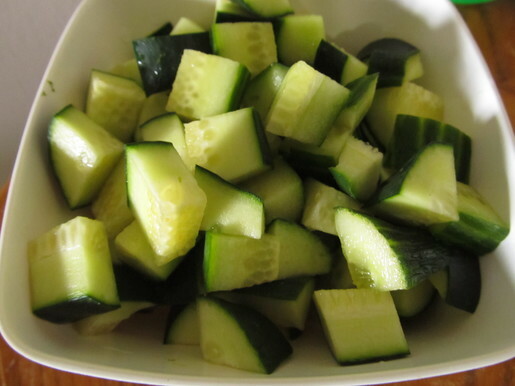 Try to use a tender cucumber in which the seeds are soft. You can add green chili if you wish. I do not add. 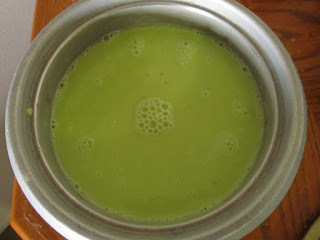 It is important to add the cucumber cubes to the mixie jar or food processor first, followed by soaked rice. I bought 2 big boxes of strawberry during one of the trips to the supermarket. After coming home, I tasted them and it was a huge disappointment. The strawberries were too sour to my liking. I made milkshakes, lassi with them, but the amount of sugar that went in making the milkshake turned me off. So, I freezed them for later use. 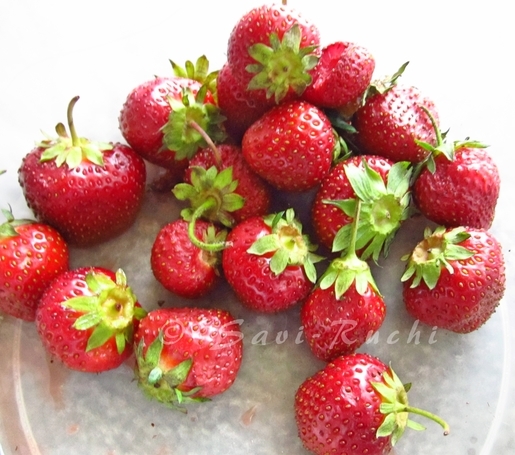 Now that its been a couple of months that I freezed the strawberries, I wanted to finish them as early as possible.. So started making new and interesting experiments using the sour strawberries. 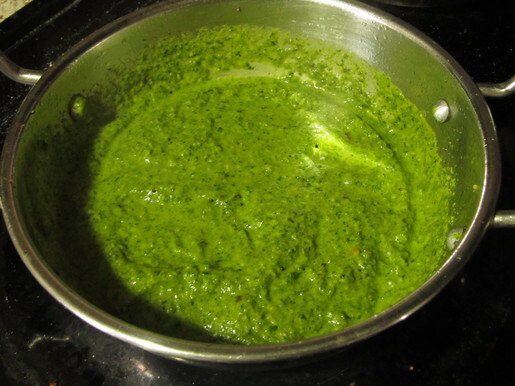 I made this chutney last week. We liked the chutney so much that I made it again yesterday. Try it to believe! If the strawberries are very sour, I recommend adding only 4-6 strawberries. Adjust the number of strawberries accordingly. I used only 6 strawberries. If the strawberries are too sweet, you could use 8 strawberries and to make the chutney sour, you could use a Granny Smith Apple to add the tart to the chutney. 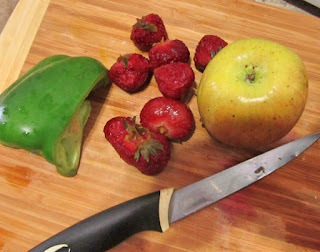 Do not use Granny Smith apple and very sour strawberries. You get the point right? We need to add some natural sugar to this chutney. 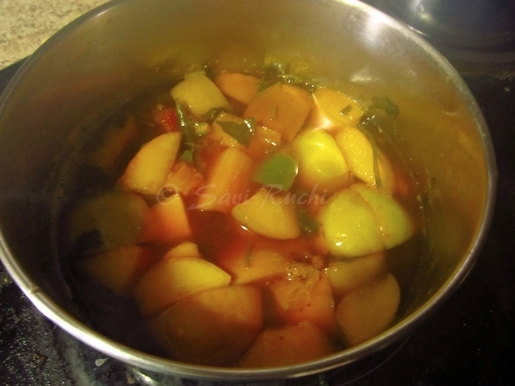 I use any other variety of apple (like Fuji apple, gala apples, red delicious apple etc) to make this chutney. The apple adds an extra texture and sweetness to the chutney. For a very mild chutney, you could add 1 jalapeno with the seeds removed. 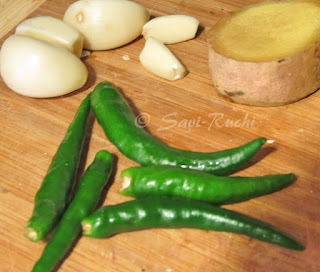 I use 2-3 Indian spicy green chilies. We like our chutney spicy. Green chilies | Jalapenos : 1-3 nos, adjust according to your spice levels. Wash the apple thoroughly. Deseed the apple and roughly chop the apple. You can keep the skin of the apple. Wash the strawberries and roughly chop them. In a sauce pan, add all the ingredients (except grated coconut) mentioned in the chutney section. I repeat, do not add grated coconut. Bring it to a boil on a medium heat for about 7-10 mins. Do not add too much water. The fruits need to get cooked. 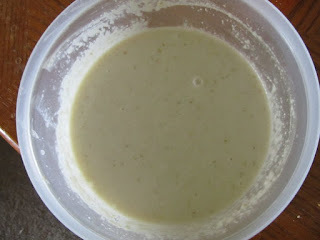 Once cool, add coconut to the mixer and add this cooked mixture. 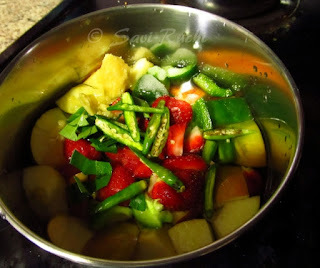 Use the boiled water to make the chutney/dip. The water would be very flavorful. Do not discard the water. That is the reason I asked you to add little water in the beginning, remember? Grind it to a medium coarse paste. Do not grind it very fine. We need some texture to our chutney. Prepare the tempering. 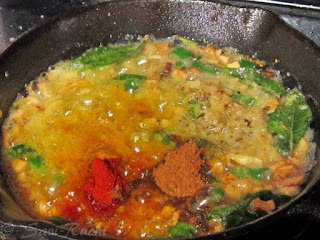 Heat oil in a small wok, when oil is hot, add the mustard seeds and curry leaves. When leaves wilt and seeds splutter, turn off the heat. Pour the tempering over the chutney. Serve the chutney as a side dish with rice, Indian flat breads, ragi rotti, gluten free sprouts bread or any dish of your preference. Wash the rice, green gram and yellow moong thoroughly. Add the water and pressure cook the rice and lentils together for 3-4 whistles.Allow the cooker to cool for 15 mins. 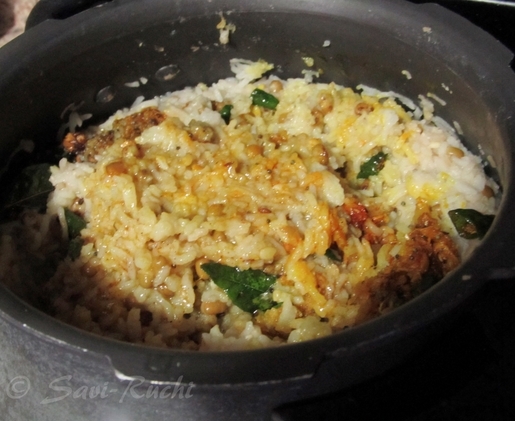 Once the rice is cool, open the lid and mash the cooked rice mixture gently. Heat oil and ghee in a small wok. Keep the heat to a medium. When oil is hot, add the mustard seeds, cumin seeds and cloves. When seeds crackle, add the curry leaves. Follow it by garlic. 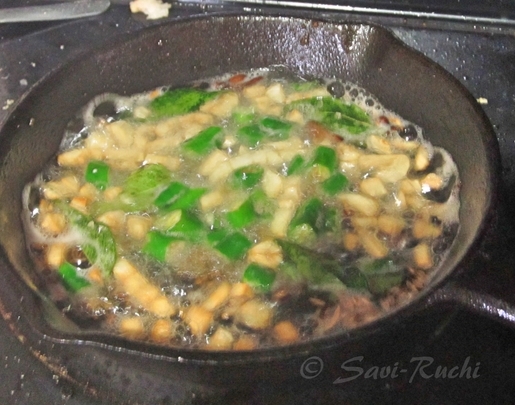 When garlic is golden brown, add the chopped green chilies, ginger paste and saute. Turn off the heat of the tempering and allow it to cool for a minute. 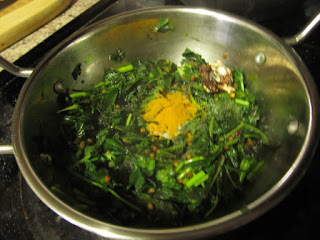 Add the turmeric powder, red chili powder and garam masala to the not so hot oil. Add the tempering to the cooked rice and lentil mixture. Add the salt and hot water (if needed). 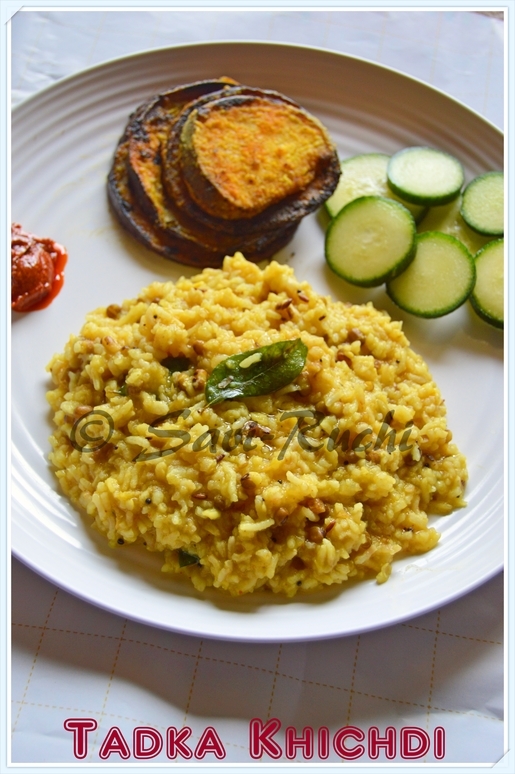 Mix well and let the khichdi cook again on a medium heat for about 5-7 mins. 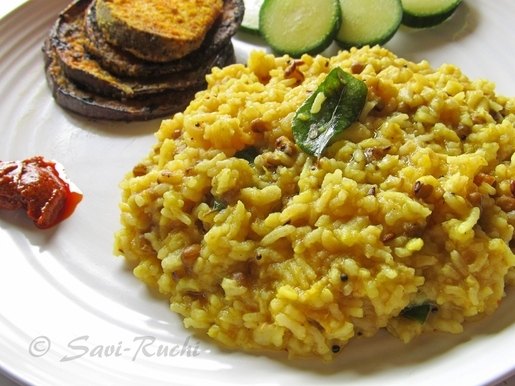 Serve the khichdi hot with a side dish of your choice. 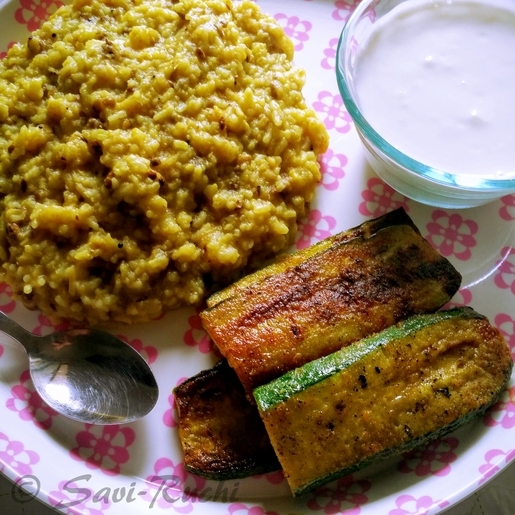 We like to eat our khichdi with kadhi, begun bhaja, salad or plain yogurt. You can use any rice of your choice. 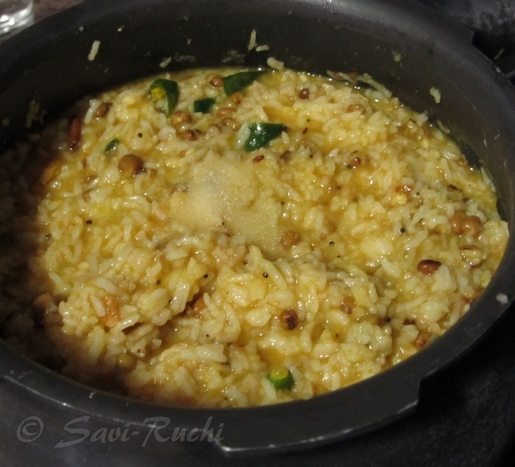 I have used basmati rice (long grain white rice), sona masoori rice (small grain white rice), and brown rice. 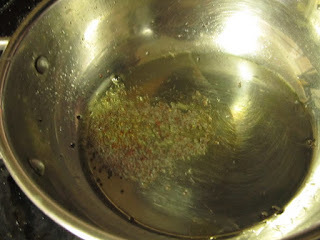 If you add the dry spice powders to very hot oil, the powders get burnt and that is not what we want. We want to infuse the flavors into the oil without burning the spice powders.